Happy Thanksgiving from my crew to you! I hope everyone is having a special day spent with friends and family. I know I am, and goodness is there so much to be thankful for! Today, I was looking at several verses on giving thanks, and I began to think on all the times in the Bible that we are told to give thanks (In every situation give thanks, with thanksgiving, give thanks unto the Lord, just to name a few). All I could do was think about what a loving God we serve. I also started to think about how through every circumstance in life, there is always so much to give thanks for. I pray that today and always, you will know that you are so loved by our Heavenly Father, and that His blessings are everywhere. There is so much to be thankful for! Oh give thanks to the Lord, for He is good; His love endures forever. I'm currently in Williamsburg, VA with my family for a little pre-Thanksgiving fun. I sure do love it here! The town is so quaint, and the fall colors have been gorgeous! It is such a fun place to visit, and I love seeing Madeline here for the first time. Yesterday was my birthday, so being able to celebrate here with my family made it even more special. I hope y'all have a great start to the new week as we get ready to celebrate Thanksgiving. Happy Friday! Today's post will give you a little tour through the Emily Ley baby book. Now just to start off, if you haven't checked out the Simplified Planners, you must! They are adorable and so whimsey, but I love…well, how simplified they are. I chose to go with the golden pineapple print this time around, and I'm so pleased with my decision. And check out her adorable note pads. These are great gift ideas! So, if you know anything about Emily Ley and her brand, you know that you she is such a joy…she and her precious family! Her products truly embody what an amazing person she is, and I love that! Be sure to follow Emily, because she is such an inspiration, especially to all the mamas out there. Now onto the baby book. It begins with a lengthy section to give a peak into time of anticipating baby's arrival (how mom felt or "In Mommy's Belly", pre-baby celebrations, etc.). I also love how there is a "Letter To You" section for you to write a letter to the baby...so sweet! And if you'll note from the photos above, there are such fun dividers between the sections with cute, colorful prints and all. And my favorite part? Notice the little gold emblem at the top corners of the divider pages. Next, the baby book moves into "Announcing Your Arrival." And at that point is where the baby story begins. From a page to fill in birth weight, length, etc., stamp the tiny hands and feet, share details of your baby's nursery, and more, you won't be able to leave out any important details :) And of course, the last section includes a page for each month of the baby's life. But most importantly, there is plenty of space for pictures! The divider pages are great for placing photos on as well. The Emily Ley Baby Book is absolutely perfect for capturing all of the sweet memories of your little one. I have had so many friends tell me how difficult it was to keep up a baby book, and I see what they mean by that now. But it is so important to keep up and something you'll cherish forever. Thank you, Emily Ley, for sponsoring this post. All thoughts and writing are my own. Hello and happy Thursday, Friends! If you know me, you know that I love a good bow. I couldn't be any more obsessed with this embroidered bow top from Chicwish. How cute would it be paired with a midi skirt for upcoming Christmas parties?! I also love this scallop wrap pencil skirt. It is so comfortable and perfect for church or work, and it is only $40. It is also available in black and blush. I love the cranberry color for this time of year. Lastly, these black pumps are a go-to, and they are so comfortable. 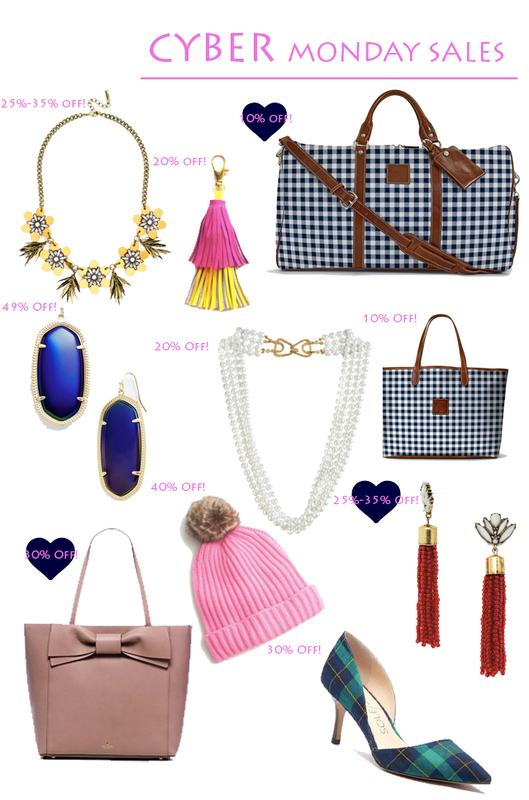 They are also currently 40% off. Oh how I love what a bow touch (and a touch of scallops) can add to any outfit. Happy Wednesday, Y'all! 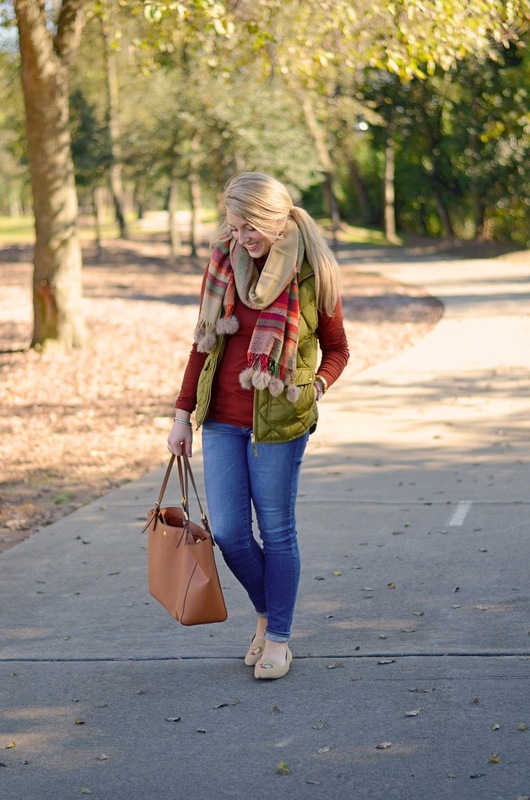 Here's another fun, easy, and comfortable fall outfit! 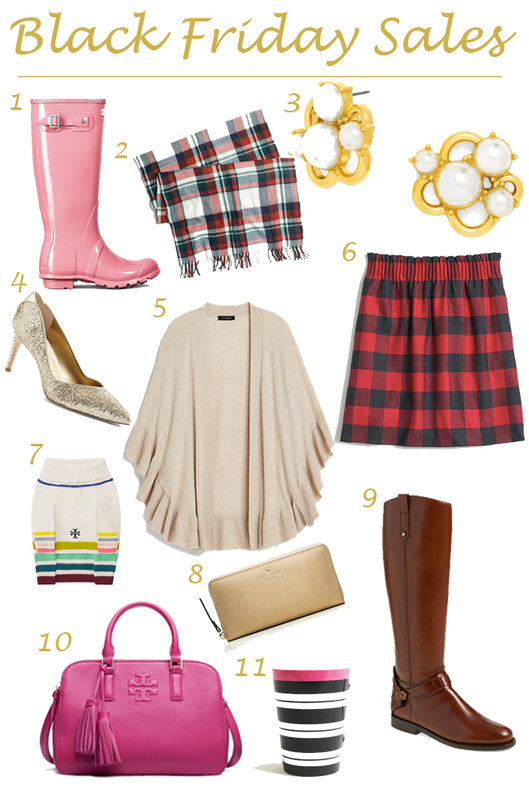 Many of my current go-to pieces in my closet are comfy dresses that I can pair with a plaid scarf! It has been so warm this fall that it is very easy to get by without wearing tights. I'm not complaining about that, although I am still longing for some crisp cool fall weather. Maybe it'll feel like fall on Thanksgiving next week (fingers crossed)! 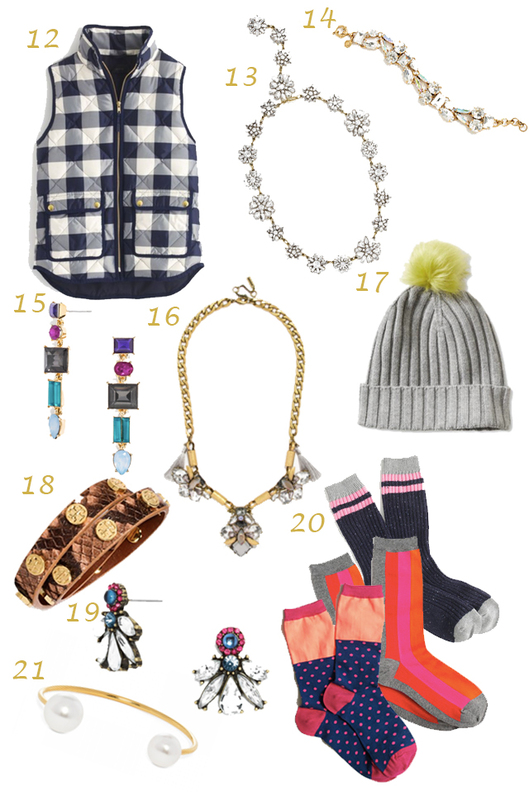 Next week I will be posting my first gift guide! I have't started my Christmas shopping yet, but I have quite a few ideas for my family and friends. I will be sure to share! What are some gift guide categories y'all would like to see (gifts for him, her, under $50, etc.)? Happy Monday! Ruffles, ruffles, ruffles…I can't get enough! How darling is this drop waist ruffle dress. I love the color so much as well. The styling possibilities are endless. You could pair it with a dressier pump for the perfect holiday party look. I kind of went bananas in Banana Republic this weekend. This dress is on sale along with these darling scallop shirts and this festive ruffle plaid top! Aren't they the cutest?! I hope y'all have a great start to a new week. Hey friends! I hope y'all are having a great weekend so far. 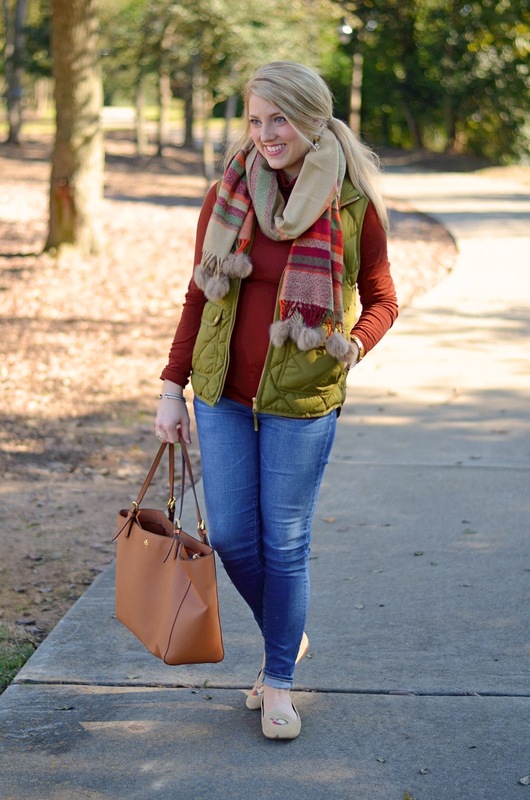 If you're looking for a casual outfit idea for Thanksgiving, here's one! 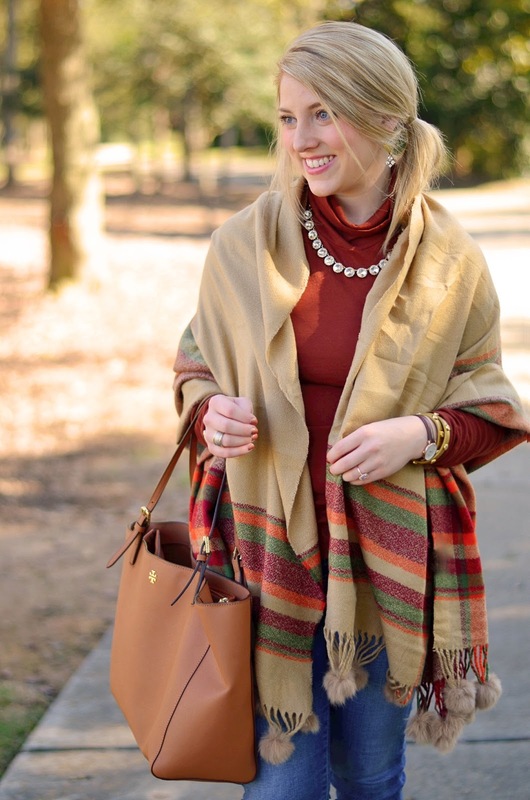 I am loving big scarves right now…blanket scarves, etc. I am obsessed with this one from Pink Pineapple Shop. 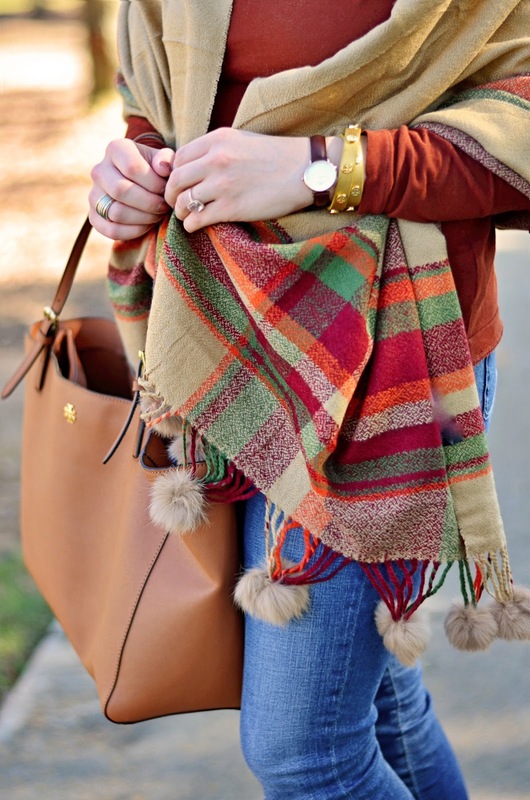 Not only do I love the colors as they are so easy to pair up with other pieces for this time of year, but I also love the little fur pom poms on the end. Here are two way you can wear it. In the first look, I have it opened up fully and am wrapping it around me to wear as a cape/poncho type look. In the second, I have it wrapped around by neck and paired with a puffer vest. Also, a simple turtleneck like the one I'm wearing here is a great piece to have in your closet. I have gotten so much wear out of it. 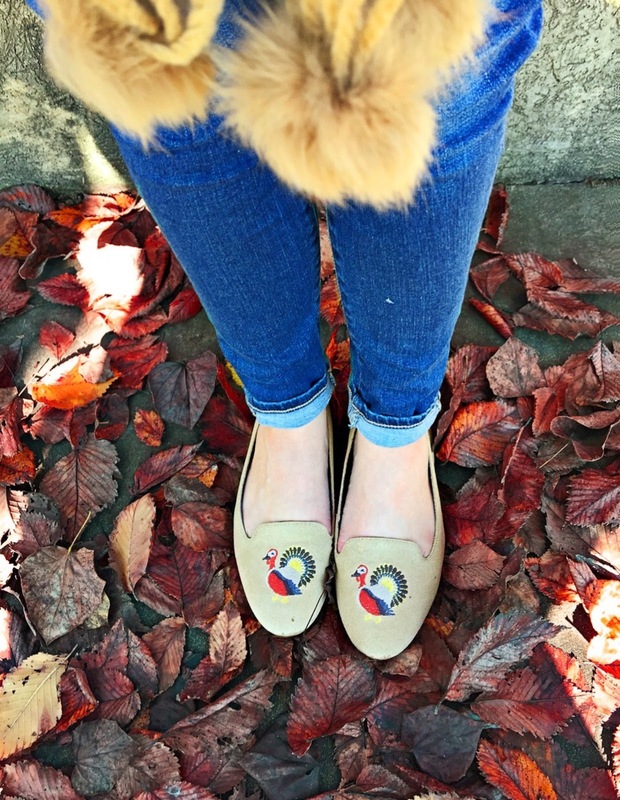 Also, these Harvest Flats from Jack Rogers are a must have! Are they not the cutest things ever!? 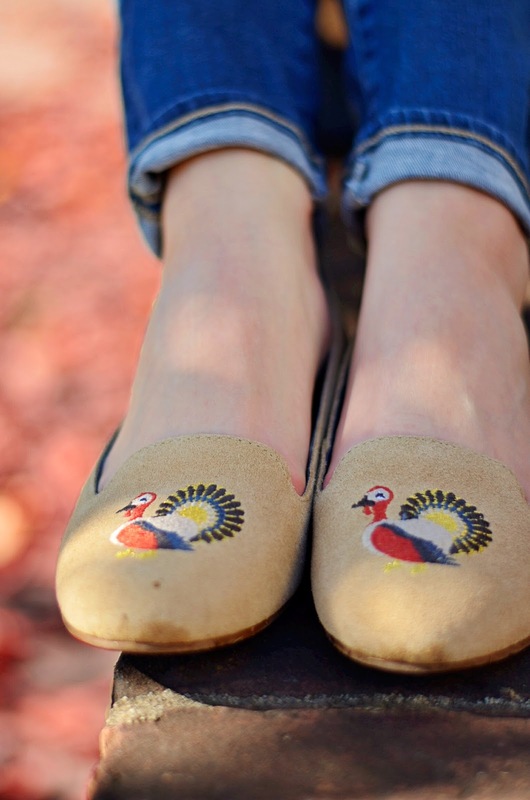 I love Thanksgiving, so a little turkey design always makes me happy. 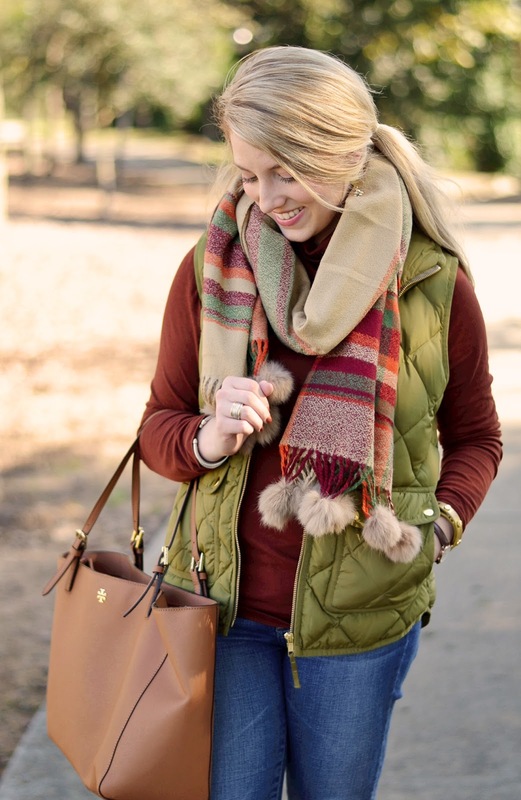 Are you planning on a more casual look or dressing up a little more for Thanksgiving this year? 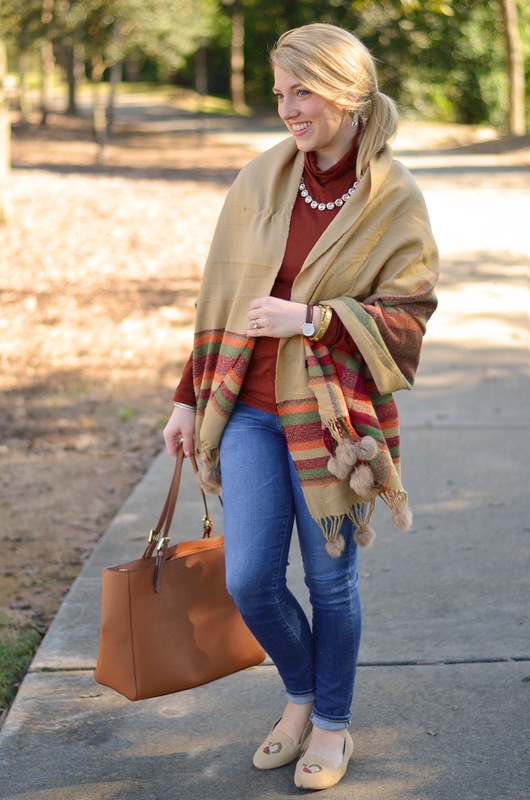 See my post from Thursday for a dressier Thanksgiving look idea.